A rare photograph of Tommy Burns appeared on a cigarette card, right, from the Ogden’s general interest set which was published around 1901. 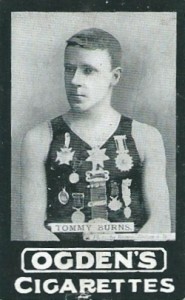 Card number 198 in the 200-card Series B carried a black and white photo of Tommy taken by Brown, Barnes and Bell, photographers to Queen Victoria. The photography firm had its head office in Liverpool and branches in cities and towns across the country. Information on the back of the cigarette card described how Tommy dived from Runcorn Bridge in 1897, swam to Liverpool, walked to London and dived from London Bridge.